Whether it is placing a toolbox on a shelf after use or returning a vacuum cleaner to the cleaning closet, keeping things tidy is a reliable way of creating a more organised home. But more often than not, this simple act can be a problem for the modern-day homeowner due to day-to-day challenges, such as a shortage of space or a lack of suitable organising options. 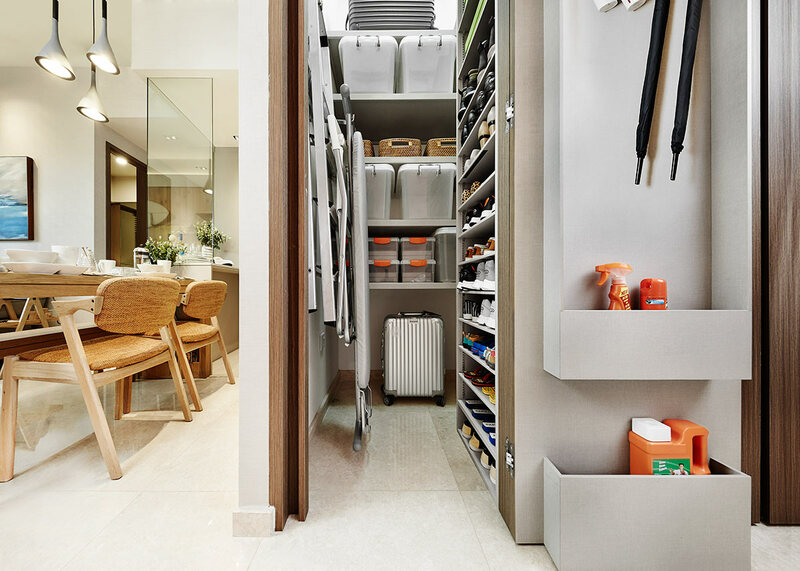 Created exclusively for Seaside Residences by Frasers Centrepoint Singapore, LIVCLO (short for Living Closet) is a home organising closet located near the living room that addresses these woes. 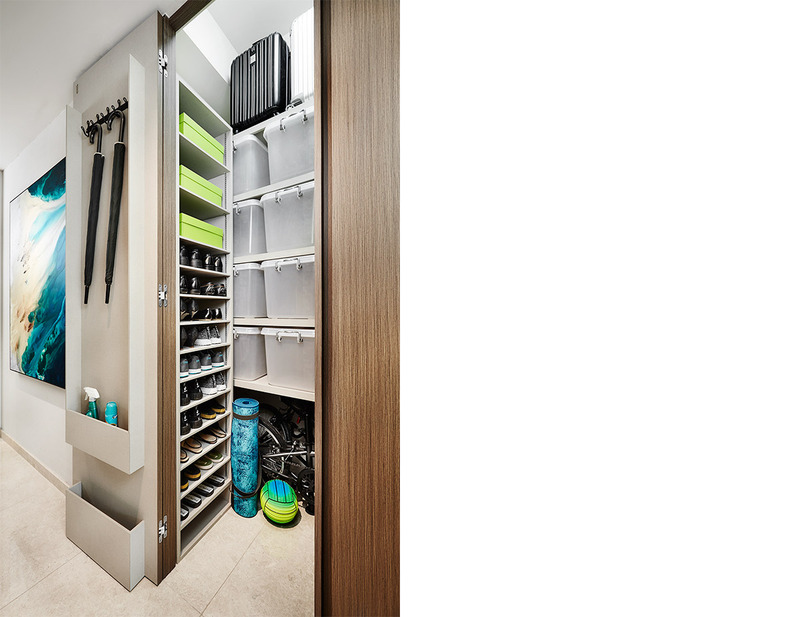 Developed and outfitted for daily efficiency, LIVCLO ensures that things are kept tidy with its highly-functional features that allow homeowners to organise their belongings. Here are some organising tips gleaned from LIVCLO at Seaside Residences that will not only help you achieve a tidier home but also free up more time for meaningful activities with your family. As a rule of thumb, it is more efficient to store rarely-used belongings in higher compartments of shelves or cabinets and frequently used ones at eye-level or at the bottom for easier access. For instance, you can adopt this organising method by placing bulky luggage bags on a top shelf, item boxes in the middle and cleaning appliances at the bottom. For better organisation, you can even designate individual shelves for specific types of items. One of the best ways to maximise every square inch in a room is to utilise empty sections of wall space for storage and organisation purposes. Multi-compartment racks and wall shelves – carefully measured to fit shoes and storage boxes perfectly – can help in making this solution a reality. 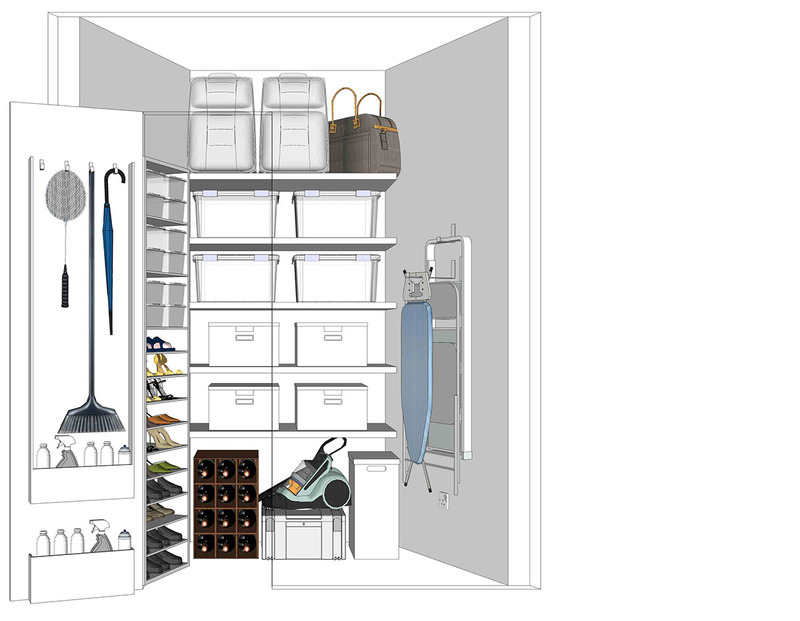 As a bonus, having plenty of vertical storage also means having a clear passageway, which makes it easier to move in and out of a tight closet. Store bulkier household appliances and belongings at the bottom shelf for easier access. Storage attachments and containers, such as hanging racks and plastic boxes, offer simple ways to upgrade the functionality of a storeroom without taking up extra space. Put these see-through accessories to good use by using them to store cleaning products, hobby supplies, toys, winter clothes and much more for a tidier, more accessible storeroom. This article was brought to you by Frasers Centrepoint Singapore, developer of Seaside Residences – the ultimate seaside residence in the East that offers you Sand and Sea at the doorstep of the future Siglap MRT Station.